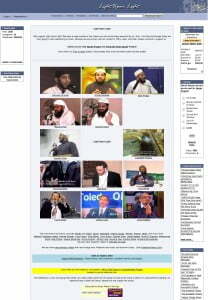 Back in 2003, I decided to to create a web site to share Islamic videos with others. 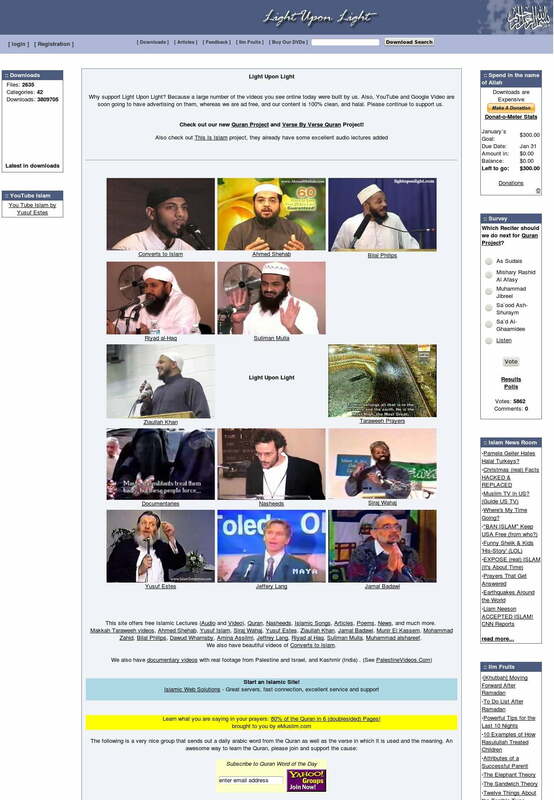 At the time, there was only Islamicity.com which offered free Islamic videos, but they were very limited and you had to pay money in order to watch them. So I decided I wanted to share Islam with others so I created a free site with Islamic videos. My friend told me that it would be too expensive to host free videos, so I created a small web hosting company in order to fund the site. I found a major challenge. Nobody wanted to allow me to put their videos online for free. Everyone was too stingy to share their Islamic videos for free online. They were profiting from selling their $10 VHS tapes in Islamic video stores and could not be bothered with putting them online. A notable exception was Khalid Jan who gave me permission to put all his videos for free online. So I had to video tape them myself. I bought some camera equipment and went to conferences and events and recorded them myself. One example of this is this Ziaullah Khan video. I still had a major challenge. Most of the sheikhs refused to allow me to put the video online for whatever reasons… Fast forward to Youtube, and everyone is doing it now. But back then, it was a major struggle to convince them. I also put articles on there, like this article praising jihad, among others. Many years later, I am now leaving Islam. The reasons are posted on my blog here. I hope that some people will find my blog and read about why I left Islam. Check out the Top Posts here. Because men and women are not equal. Islam does not require women to be srpoprteus for men. Men has to pay all expenses bills, children’s education, women’s daily expenses etc. There’s no binding on women to pay for any expenses. In fact as per Islamic Legal rules, women are not even bound to take care of the family. There’s nothing men can do if women do not take care of the family and wants to engage servants to do all the job. Women is not required to fight, does not have to go to war, do nasty jobs like clean sewerage, become construction workers and so on. Men has to do all those nasty, physically challenging jobs.Men and women have different qualities, role and responsibilities and thus difference in them requires different guidance.The verse 4:128 explains the situation when men is the troublemaker instead of women and what women should do in that situation. I appreciate you asked the question, so that others can correct you. In Islam men and women are equal, but in different ways. Both are worshipping Allah and has to do good deeds. Men is the one who goes to work and take care of the family, Women is given as a gift for the men. Women is the queen and all in charge of the house. She has to cook, wash, clean, she is the one who become pregnant, she is the one who carries the baby for 9+ months with all the difficulties, after all she has to suffer the pain, then take care of that baby for the entire life, where men are not eligible for that, and we cannot. Allah is the creator of everything, He knows the best. A car manufacturer will know how to fix it and where to place the things, a tyre cannot complaint that it has to roll all the roads and the front glass cannot be proud because it is in the upper level, without that also the car will function. All the functions put together will give as a nice and complete car. Will we accept a car with a damage or something missing?? ., Likewise the creator knows where to place the things and the people in our life to make it happier and complete. The eternal and complete life is hereafter. If we think we will get more examples from the nature. Stick to reading the translations of Quran. do good and forbid evil. Let Allah guide us in a straight path. My answer is simple and direct !. Quran 39:7 If you disbelieve – indeed, Allah is Free from need of you. And He does not approve for His servants disbelief. And if you are grateful, He approves it for you; and no bearer of burdens will bear the burden of another. Then to your Lord is your return, and He will inform you about what you used to do. Indeed, He is Knowing of that within the breasts…..
*,. 17:48 Look how they strike for you comparisons; but they have strayed, so they cannot [find] a way. 17:53 And tell My servants to say that which is best. Indeed, Satan induces [dissension] among them. Indeed Satan is ever, to mankind, a clear enemy. Creator and Allah, are not two different? Allah is god. God cannot be one, because we human are many. Creator cannot be two. Creator is the one who looks PURPOSE for His creation. Creation must be whole not in instalments or with periodical models. When He create human, everything need to human including beautification is done once for all. No R&D with the Creator. He is incomparable. Things created by man should not compare with things created by the creator. Our creation will have R&D till we exist. The PURPOSE of human in total the Creator must be looking for. The Creator must be the creator of gods too. Since it uttered as Allah, Allah cannot be only one. As every human is a separate individual, so must be with Allah too. We human die because we are given a body. Gods cannot be with body, so we should not equalise a god with the Creator.. The PURPOSE our death decides whether we are of a god or of Creator. Because we chose to worship a god, a created one than the Creator. no problem, Allah does is not in need of you rather you are in need of Allah. Enjoy disbelief because its only you who will be alone in that grave. I used to download lectures and interviews from nadeem lightuponlight – I see more reason to believe that it’s true than to deny, and I see many totally made up hadith about the Peophet pbuh – the conflicting stories about abu dharr al ghifaari’s acceptance of Islam should prove the fact that some people had imaginations. The sky has many layers and is not just empty, if something goes wrong with the sun’s elecmag rays or the earths inertia or gravity – it can all retract collapse inwards finish us off, or float off and leave us without oxygen. I have a strong feeling that you messed up somewhere and shaytaan started from there. Please check the forum, Qarn and Quroon mean generation/s in THE QURAN gog and magog are met at round 2 maybe. Prophet told you – read kahf during the testing. My woman nearly diverted me to debauchery too, but it never satiates. And the truth was always some pining that remained ’til I woke out of my drugged slumber..and the more obvious their desperate efforts to hell became, the stronger and more determined I became. You claimed that you couldn’t fathom how the sun could run an orbit due to observations stating that the earth orbits the sun…. The galactic year, also known as a cosmic year, is the duration of time required for the Solar System to orbit once around the center of the Milky Way Galaxy. Estimates of the length of one orbit range from 225 to 250 million terrestrial years. The Solar System is traveling at an average speed of 828,000 km/h (230 km/s) or 514,000 mph (143 mi/s) within its trajectory around the galactic center, a speed at which an object could circumnavigate the Earth’s equator in 2 minutes and 54 seconds; that speed corresponds to approximately one 1300th of the speed of light. “By Allah the One, a man amongst you may do good deeds till there is only a cubit between him and Paradise and then what has been written for him decides his behavior and he starts doing (evil) deeds characteristic of the people of the (Hell) Fire. And similarly, a man amongst you may do (evil) deeds till there is only a cubit between him and the (Hell) Fire, and then what has been written for him decides his behavior, and he starts doing deeds characteristic of the people of Paradise.” Narrated by Al-Bukhari. The miracles of modern technology have helped man to look at the world and the concept of god very differently from how his forefathers did. That Quran has been modified! …changing the message of the Quran tremendously! I am working on a book to cover not only some of these changes, but also the tribal traditions passed on from generation to generation regarding the first few decades of Islam. A large number of instances of the word “Al-kutub” (= the Books) were changed to “Al-kitab” (= the Book). The Uthamn (or first) edition had no instances of the word “Book” – unless it was a specified book of the Jews or Christians. The innumerable instances of “Books” ALWAYS meant the Books of the Jews and the Christians (Torah, Injeel, etc etc). Prophet Mohammed only read the Books of the Jews and the Christians. And these are the Books mentioned in the Uthman edition of the Quran. But the third edition changed the words in such a way that the Muslims have decided the the “Book” is the Quran! There was no book called Quran during Prophet Mohammed’s lifetime!